It has long been accepted that successful recovery from alcohol and drug dependence is a long-term journey and not something that can be achieved alone. Support networks across communities and among those in treatment and recovery are an essential cornerstone of this journey. The latest available figures show that over 300,000 adults (aged 18 and over) were in treatment for alcohol and/or drug dependency in 2013/14. Achieving the best possible recovery outcomes for those in recovery is a key public health concern in England. To support the development of quality and effective treatment and recovery services, Public Health England (PHE) has produced a suite of resources to highlight the benefits of, and encourage local services to adopt, mutual aid and service user involvement. PHE’s service user involvement guide was launched at our national ‘Experts by Experience: The assets brought by recovering drug and alcohol users to treatment and recovery substance misuse’ conference in Birmingham, which celebrated the positive contributions made by people in recovery to formal treatment services, including the delivery of mutual aid and the development of innovative community projects. By strengthening effective links between treatment services and mutual aid groups we can improve recovery rates. We know that mutual aid provides a platform to community integration and developing the wider assets needed to achieve recovery. NICE guidance supports this (CG51 and CG115), recommending that treatment staff not only inform service users about local mutual aid groups but actively facilitate their initial contact with a group, and support their sustained attendance. Mutual Aid refers to the social, emotional and information-based support provided by, and to, members of a group at every stage of recovery. Mutual aid groups may include people who are abstinent and want help to remain so, as well as people who are thinking about stopping and/or actively trying to stop their alcohol or drug use. The most common groups in England being 12-step fellowships, like Alcoholics Anonymous (AA) and Narcotics Anonymous (NA), and SMART Recovery, which apply cognitive behavioural techniques and therapeutic lifestyle change to its mutual aid groups to help people manage their recovery. There are also mutual aid groups that exist to support families and friends of people with addictions to alcohol and drugs, such as Al-anon. The suite of PHE guidance documents below, co-produced with representatives of mutual aid groups, commissioners and service managers, provide advice, support and further resources for creating effective links with mutual aid groups. 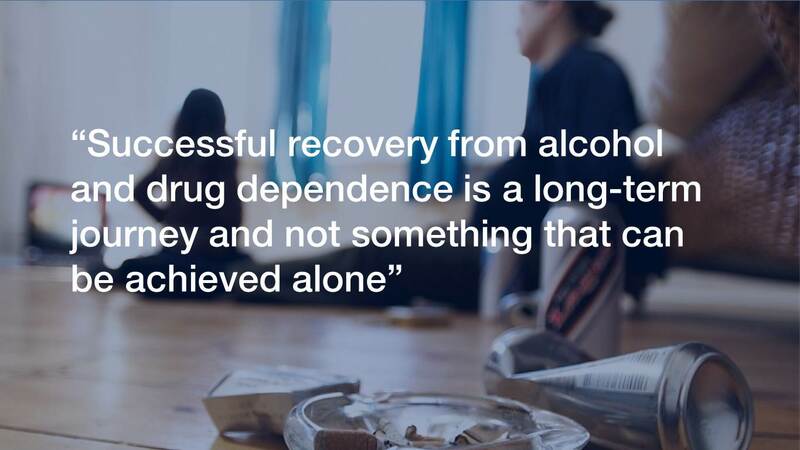 Involving those who are in recovery from addiction in the design and delivery of support services has contributed significantly to the evolution of effective alcohol and drug treatment systems in England. PHE’s service user involvement (SUI) guidance looks at the evidence, the different levels of involvement and the impact of involvement on both service users and treatment effectiveness. Service User Involvement (service user being a person who is a past or present user of drug or alcohol recovery services) is about making sure that the people who use services are meaningfully involved in the planning, development and, where appropriate, delivery of effective support and other interventions provided by those and other services. People recovering from addiction can have very limited skills or employment experience, and often have significant problems with unstable accommodation – we know that addressing these issues gives people the best chance at life-long recovery. SUI is an opportunity to engage these people in their own long-term recovery, while at the same time inspiring others. Seeing successful stories of recovery from alcohol and drug use motivates those still suffering from addiction to engage with treatment. They have expertise to share as well as, and an important contribution to make to the design, development and delivery of initiatives to help people affected by alcohol and drug use. Because of their direct experiences of services, service users know better than anyone what works – and what does not. Across the country we have seen much enthusiasm for SUI with a mixture of creative and tailored SUI services, for example a furniture up-cycle project in Hertfordshire and a community interest company in Birmingham that provides accommodation, business opportunities and accredited training. To further support the growth of tailored services, earlier this year PHE awarded £10 million of capital funding for services that are helping people in England with alcohol or drug problems. A substantial proportion of this went to projects that provide tailored education, training, skills and employment support to people in recovery, and to projects that provide safe and secure accommodation from which it’s possible to recover. PHE continues to support local authorities and their communities in assessing and improving the effect of their substance misuse services. This is vital to ensure local prevention and treatment interventions meet the wide range of needs in the local area and we know that tailored approaches that invest in the individual and the community will lead to the best outcomes.